Discussion in 'Tutorials and Tools' started by error.mdl, Aug 5, 2018.
wear off quickly as you use the hud. designer. You'll probably want to make your own. it on the head bone, your head gets scaled down to 0.0001 in game locally. you will be unable to see it in game. Instead, drag it on to the neck bone. hud pop up in your face when you get very close to your head. If you want to use the face cam, there's some annoying setup you need to do. near the top. Click it, and once its done re-open your original scene. in the folder with your textures right click and hit Create->Render Texure. flag to solid color and change the alpha value (A) to 0.
keyframe setting the frame number in the respective gesture. material, the shader looks for vertex colors to determine the proper output. Secondary Texture (0.5, 0.5, 0), Flip-Book Texture (0.5, 0, 0.5). compass's horizontal UV component must cover the entire texture. around the objects center. Position it in the shader itself. settings in unity to 1 and turn off use file scale. Note that the current example mesh only works in VR. In Desktop, if your aspect-ratio isn't close to 1:1 the bottom of the hud will get cut off. I may design a desktop-specific example in the future. Also I can't upload an image, because apparently that's spam. UPDATE: Added two new hud meshes that are compatible with desktop. Also added a bottom frame to the screen on the huds with those and fixed the default range on the example material. WARNING: If you're using a headset with an OLED screen (Occulus, Vive) you need to keep the alpha of all the tint values rather low (like around 50 or so). OLED screens suffer from burn-in, and having a static image always displaying on your screen will cause that eventually. Keeping the alpha low will dramatically reduce the chances of burn in. 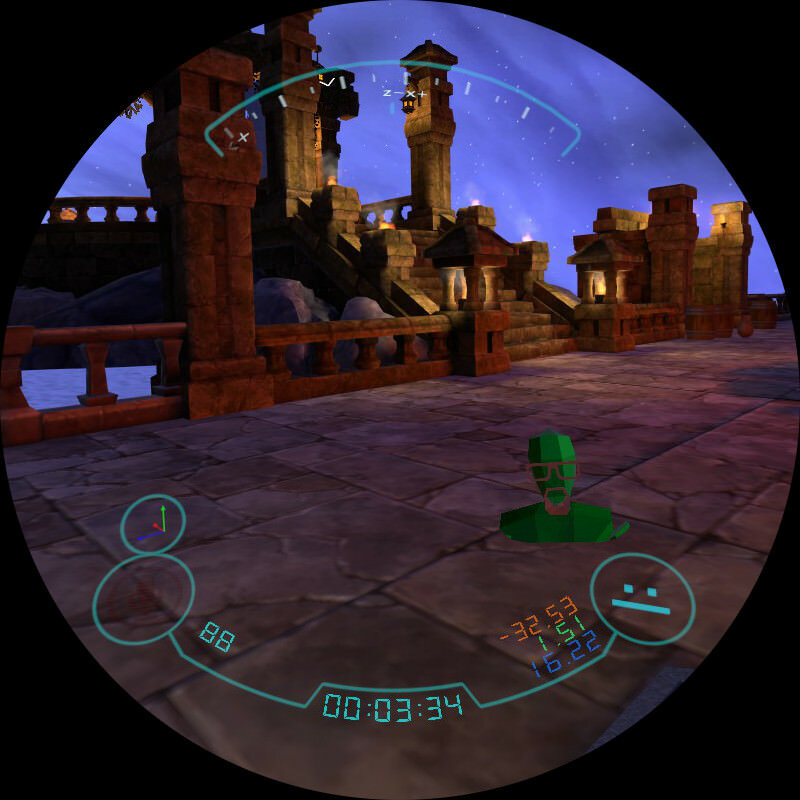 I've been using a version of this hud for about five months on one of my most commonly used avatars. The alpha for the hud is close to opaque. I only just noticed some very subtle burn in happening on my vive. Its only just barely visible in dark areas with uniform color, but I thought I'd give a warning. Added new features to prevent burn in. Added optional holographic scan lines and alpha noise, as well as a jitter feature that allows the hud to slowly drift around the screen within set bounds. These should dramatically reduce the chances of significant burn-in. OurHorizon417, Mr.Crane, gatosyocora and 5 others like this. Mr.Crane, LegacyPanda, Lamb and 1 other person like this. Still can't upload any images. Thought it was because of the host I chose, but it doesn't seem to matter. Tupper plz fix. I did everything you said for attaching it to my own avatar... but for some reason I can only see the HUD when I look straight down at the floor. Any possible ideas? Update: added a couple new burn-in prevention features. For people trying to make their own hud meshes, make sure that the hud is pointing in the right direction! In order to work, the hud mesh must point along the +Z axis in unity when all the rotations are set to 0. Additionally, the origin of the mesh is where your head will be located. Make sure you set the origin of the mesh to the world origin in blender, and not the meshes center. If your hud isn't showing up, try throwing a huge box surrounding your head on the hud mesh. 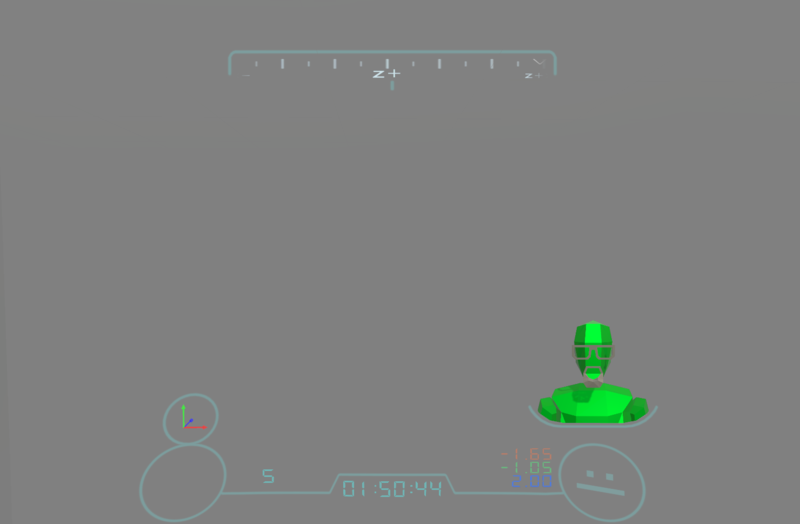 If you can see the box, the hud is facing the wrong direction or your meshes origin is off. Another common error is FBX export in blender is set by default to scale blender units to 0.01 unity units. This often results in the hud being closer than the near clipping plane to the camera, thus rendering it invisible. The proper scale is 1 blender unit to 1 unity unit. You can uncheck "use file scale" in the unity import settings and manually set it to 1 to fix this. Firestorm, if you can only see the hud when looking straight down that means the bounding box of the hud can only be seen when looking at the floor. Swap the hud back to standard shader to see where it is on your avatar. Make sure its rotated so that the hud is in front of your face. Also you can scale up the hud so the bounding box is larger. It won't effect the hud shader at all since it only looks at the original mesh's proportions. Using this, if you add effects like night vision, it looks fun.